So I could have named this recipe a number of things. And in the end I settled on Chicken, Black Bean with Salsa Soup. Once the chicken has cooked through, add the cooked black beans, the cooked red beans, the broth and water. Stir in the frozen corn, no need to thaw, as well as the salsa. Bring to a boil, then reduce heat to medium low and let simmer for 15-20 minutes. (Time it so that the cooking scents are at the best when your spouse walks in the door from work!) Season with salt and pepper to taste. Ladle into bowls and top with a pinchful of shredded cheese and a slice or two of fresh avocado. 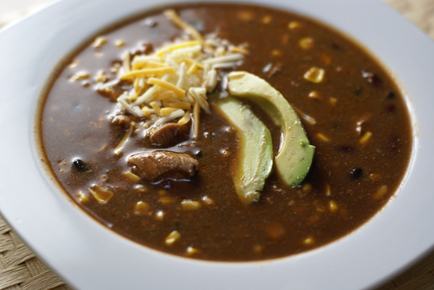 Serve Chicken, Black Bean with Salsa Soup with Cheese and Avocado Slices. Erin – I am so excited to try this recipe! I know it will cost more, BUT I am assuming I can substitute GOYA beans if I do not have homemade handy. I just may have to make it this weekend – THANKS again for all your great recipes. I’ve tried and enjoyed many of your recipes. But this one was especially wonderful! I’m not very good at soups, they never seem to come out right. But this was perfect and gone in a flash! I have to make it again tonight. Thanks for sharing. This sound so delicious! It’s definitely going into the menu this weekend. But, here’s a question for you…my kids (ages 4 and 1) absolutely refuse to eat soup. We’ve tried serving it with grilled cheese sandwhiches (for dipping), cornbread, rolls or draining off most of the liquid etc. and yet it still goes untouched. Any ideas on getting kids to eat and enjoy soup? Thanks! 1- if I used canned beans, I don’t need to precook them, right? 2- Could I make this in the crockpot? Would I need to make any changes? When I first introduced chili to my kids, I made it mild simple (no onions and peppers) and thick and served it over tortilla chips with lots of shredded cheese. I called it nachos instead of soup or chili. Then I started hiding more veges like onion, peppers and now I add shredded zucchini and a scoop or two of pureed pumpkin or butternut. They never know! I still serve it with chips and call it chili, chips and cheese.